How best to deal with dogs fear of thunderstorms? Dogs and thunderstorm tend not to go well together. Firstly, because dogs have much better hearing than we humans do. Most dogs therefore don't like loud noises, like thunders, fireworks, and shooting. Dogs fear of thunderstorms is though more complicated, as it is not only about the loud noises. Thunderstorm for dogs not only means thunders and lightings. It also includes barometric pressure changes, static electricity, and low frequency rumbles preceding a storm that we humans cannot hear. According to one theory, dogs experience painful shocks from static build-up before the storm. This is why our dogs can start to become agitated before we realize storm is coming. This also explains why it can be more difficult to deal with thunderstorm phobia in dogs, than say fear of fireworks. There are things you can do to help your dog live with his fear of thunderstorms. The sooner you start the better, as the problem is likely to escalate over time if not dealt with early on. It is usually easy to detect if your dog is scared of thunderstorm or not, but the most common signs include shaking or trembling, pacing or restlessness, seeking shelter, staying close to the owner, inability to eat, destructive behaviour, loss of bladder or bowel control, etc. Your dog may start to show these signs prior to you noticing the storm coming, and the more intense the signs, the more likely your dog is suffering from Dog Noise Phobia. These changes in your dog's environment may be enough if you start them early on in his life, or your dog is not nervous type. Your dog is unlikely to start loving thunderstorms, but he may become accustomed to them and learn to live with them. In some cases, more is needed, e.g. if thunderstorms are very rare, or very common, where you live. Some dog breeds are also more likely to develop fear of thunderstorms than others are, e.g. Collies, and German Shepherds. Dogs with other fearful behaviour, like separation anxiety, are also more likely to develop any kind of dog noise phobia. In severe cases, you should seek professional help. Behaviour modification techniques, like systematic desensitization and counter-conditioning may help ease the fear. Sometimes, prescribed medication for dogs may be required as well (the last resort for most dog owners). There are number of dog behaviour modification techniques that can help your dog overcome his fear of thunderstorms… or at least learn to live with it. The most common techniques are desensitization and counter-conditioning. Desensitization is about gradually exposing your dog to the noise he fears. To treat thunderstorm phobia in dogs, the dog is first taught to be calm when the noise level is low. The noise level is then gradually increased. This is repeated until the dog appears to have lost his fear of thunders. It is best to perform this process during the "off" season for thunderstorms. You need a tape or CD of thunderstorm sounds (widely available, e.g. on Amazon). You also need some kind of a treat or reward for your dog when he accomplishes what he is supposed to, which is to relax during the sound of thunder. It is vital that the dog is not rewarded while he is fearful or anxious. Counter-conditioning is about teaching the dog to display an acceptable behaviour as a response to a certain stimulus, in this case thunder. This is done by associating the feared noise with something pleasurable for the dog, e.g. favourite toy, treat, or game. This way the negative stimulus (thunder) becomes associated with positive event (treat). Over time, the dog will start associating oncoming storm as getting his absolute favourite thing in the world. Using dog behaviour modification techniques requires full commitment from the dog owner. They work by repetition, so it takes time and patience… lot of patience. Most dog owners consider prescribed medication for dogs as the last resorts. Drugged dog is not a pretty sight and most anxiety medication for dogs comes with some side effects, sometimes substantial. 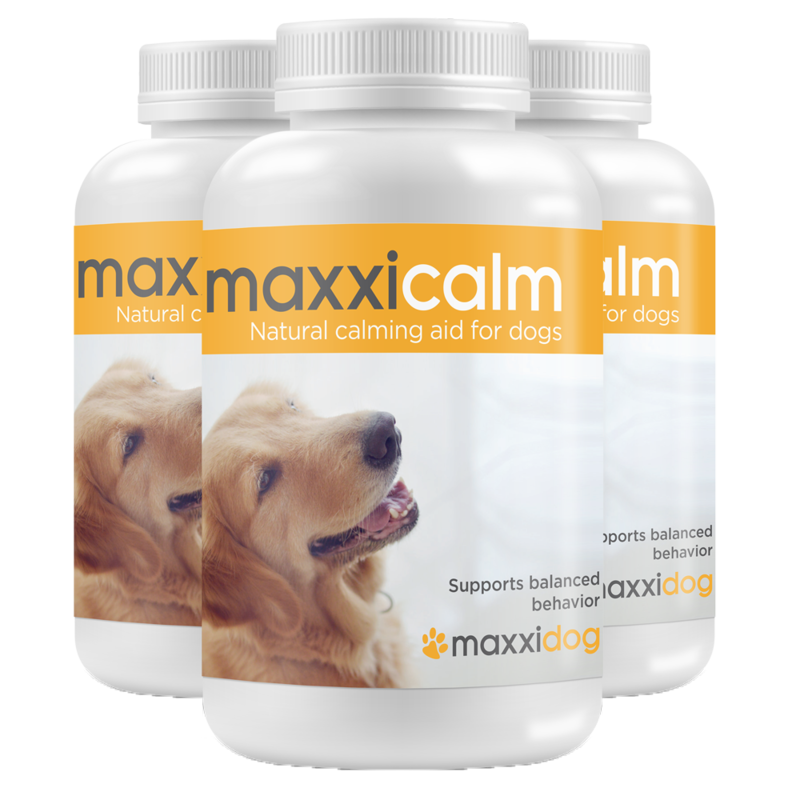 Natural calming aid for dogs, like maxxicalm, or pheromone diffusers, can help up to certain extend, especially when used with other treatment options, like dog behaviour modification techniques and changes in the dog’s environment. However, in the most severe cases of thunderstorm phobia in dogs, your Vet may recommend dog anxiety medication. The medication can be described for specific event, e.g. when thunderstorm has been forecasted. If you live in a thunderstorm area, then dog anxiety medication can be required during the entire thunderstorm season. Sometimes combination of medication is required.